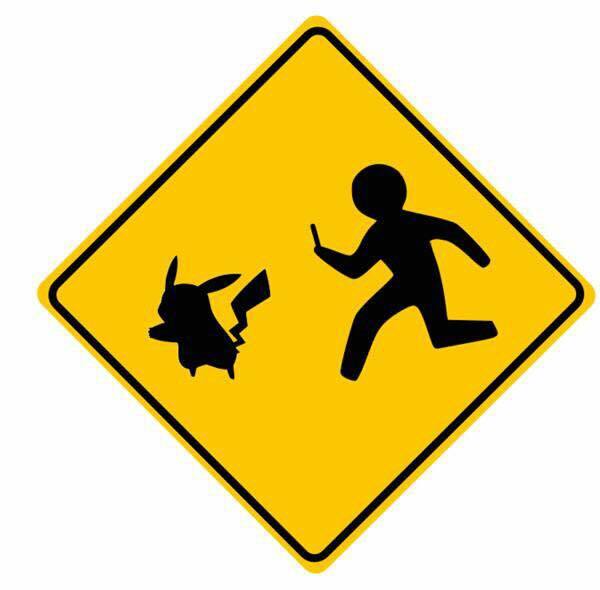 Are you ready to have little Pikachus in your facility, and a lot more foot traffic? From Lures to Pokéstops, keep reading to learn the valuable terms that can increase your sales. This blog will provide you tips and tricks to get you in the game and ensure you can handle all of that extra business with ease. Restaurant tips from Yelp’s blog - Catch More Guests for your Restaurant with Pokémon Go . Convenience store and gas station tips from industry publisher Convenience Store News, How Should C-stores Get Going Around Pokémon Go? Hotel & Hospitality tips from HotelMarketing.com, 7 Ways Hotels are Embracing Pokémon Go, and A Hotelier’s Guide to Pokémon Go from HotelOnline.com. Retailers take note with this story from Forbes.com, Mobile Lessons Retailers Can Learn From Pokémon Go. Now you know what Pokémon GO is, but you’re wondering what in the heck a Pokéstop is. It’s an important place in your city –historic landmark, art installation, etc. You can’t make your location a Pokéstop (only the game’s developers can do that), but you can use Lure Modules to entice players to a Pokéstop near your location. It’s a little bit of the “build it and they will come” philosophy. Step 1: Talk to your Marketing department for ideas, and to request signage to place in your storefront, lobby, or sidewalk space or look to some of the major brands out there for tips on how to leverage this interactive game with increased off-peak sales. Step 2: Find out if there is a Pokéstop near your retail location. Step 3: Offer an incentive (a discount during your off-peak hours, free drink, free Wi-Fi, BOGO, etc.) to Pokémon GO players. They’ll then use a Lure Module on the Pokéstop near you. This attracts more catchable Pokémon characters near that location for 30 minutes at a time. Step 4: Get busy serving your new customers! Grown-ups love Pokémon GO too! Did you know that the local watering hole is also seeing an increase in revenue? Adults who stay and play are ordering more drinks and food to collect more Pokémon, rather than staying for just the Happy Hour special. 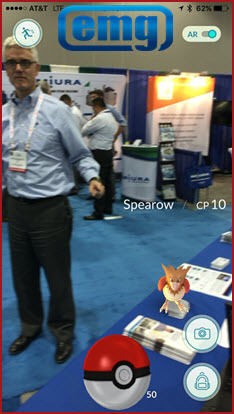 Our own Matt Munter and team had some fun with Pokémon GO at a local tradeshow where Spearow made an appearance at the EMG booth. Pokémon GO is bringing together communities (and starting conversations at tradeshows). Website 12UP compiled the this article which tells the story of the game bringing families together, raising the morale of hospitalized children, lifting the spirits of a veteran with PTSD, and more. Not up for huge crowds in your lobby or on your sidewalk? We all have our reasons. If your location is made a Pokéstop (remember, only the game developers can do this), and you do not want extra foot traffic, please see this article (imore.com) for details on how to request removal. We don’t know how long this engaging craze will last, but here’s to hoping you are able to take advantage of the wanderers in your city. Not all who wander are lost. They might just be looking for your brand, and not even be aware of it. Help them find you! We’d love to hear from you! Share your stories or pictures. Let us know if you’ve had new customers engage with your brand just to catch imaginary critters.